The Washington Post's religion writers have been hard at work of late to boost the religious left's push for more stringent gun control legislation. On Thursday, for example, Post religion writer Michelle Boorstein treated readers of the paper's Metro section with a puffy front-page item celebrating the pulpit-pounding for gun control from the likes of the dean of the Episcopal Church's National Cathedral, Rev. Gary Hall, a self-described "left-wing Democrat." Hall has cravenly lumped gun control in with the message of the Christian gospel, using liberal applause lines like "I believe the gun lobby is no match for the cross lobby." According to the startling results of a survey released last week by the Public Religion Research Institute, 57 percent of white evangelicals live in homes where someone owns a gun (compared, for example, with 31 percent of Catholics.) And more startling, even after 20 first-graders were slaughtered in Connecticut at the hands of a madman with an assault rifle, 59 percent of white evangelicals continue to oppose tighter restrictions on gun laws. 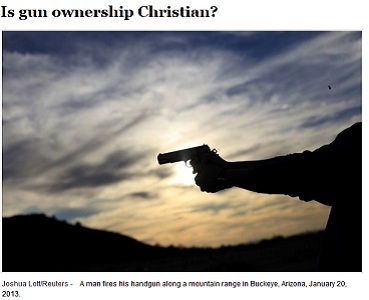 An obvious question occurs in light of these results: How do such Christians reconcile their stalwart commitment to the Second Amendment with their belief in a gospel that preaches nonviolence? The Christian Lord allowed himself to be crucified rather than fight the injustice of the death sentence imposed on him. “If someone strikes you on the right cheek, turn to him the other also,” he says, in the Gospel of Matthew. The Bible is mute on the matter of guns, of course, but it is impossible to imagine that Jesus would find anything good to say about them. Curbing gun ownership is the gateway to curbing other rights. “There’s a suspicion of a too-powerful state,” Russell Moore, president of the Southern Baptist Theological Seminary, told me. “Sometimes one will hear that if the government has too much power over guns, it will also have too much power over freedom of speech, freedom of religion.” The minute the state starts dictating the kinds of guns a citizen can own, this argument continues, it has gone over the line. Moore himself is not opposed to universal background checks and emphasizes that on the matter of gun control, believing Christians can disagree. Self-defense and love (and defense) of neighbor are biblical values. This is how former Southern Baptist Convention official Richard Land, in an interview on National Public Radio in December, defended his support of arming teachers. A similar argument was put forth by David French, senior counsel for the American Center for Law and Justice, in an article in Patheos several months ago. Going back to Noah, through Exodus and the prophets, French builds his case, and he concludes with the moral philosopher John Locke, who called the right of self-defense “a fundamental law of nature.” “The defense of self, the defense of others is not only biblically authorized but, in certain circumstances, is a moral imperative,” French told me. “Turn the other cheek does not mean turn your wife’s cheek or turn your children’s cheek.” Gun control, he wrote in Patheos, is the state’s effort to deprive humans of their God-given right to self-defense. Of course, there's a tremendous difference between dying a martyr's death to further the message of the Gospel of Jesus Christ and being killed by a home invasion burglar or bandit whose violence is not predicated on religious persecution. There's nothing in Scripture to suggest that Jesus advocated a complete aversion to self-defense or that self-defense is in and of itself sinful. The text in question is not a call to arm oneself for offensive purposes: Jesus clearly didn't desire his 11 remaining apostles to be armed to the teeth and the primary import of Jesus's statement is noting that a prophecy must be fulfilled. But clearly just as a knapsack, moneybag, and sandals were necessary for lengthy journeys in the ancient near east, so would a sword -- for fending off bandits and wild animals -- be a legitimate implement to carry. An honest evaluation of the relevant texts would show Jesus condemns the use of the sword as an offensive weapon for the spreading of the Gospel, but does not condemn the sword altogether for use in self-defense nor in the execution of temporal justice by the state. Of course, that would require a willingness to read Jesus and the whole counsel of Scripture in context, rather than conveniently cherry-picking him to rebuke pro-gun rights evangelicals and calling them to repent of their political views.